KONELĪNE is a sensual, cinematic celebration of northwestern British Columbia, and all the dreamers who move across it. Some hunt on the land. Some mine it. They all love it. 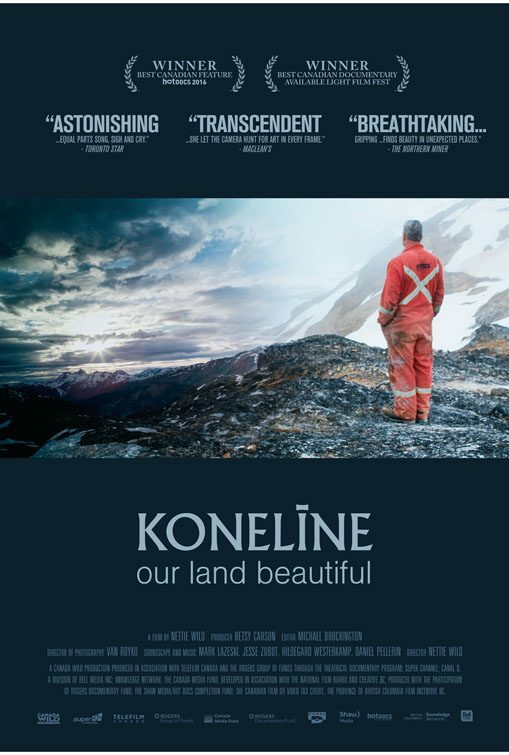 Set deep in the traditional territory of the Tahltan First Nation, KONELĪNE reveals the stunning landscape to the north, and charts the tension between a still relatively pristine beauty and the scars that economic development inevitably brings in the form of resource extraction and power lines. KONELĪNE seeks to find the poetry of everyone in front of the lens – from diamond drillers to elders who protest against them. An art film with politics, drama, and humour, KONELĪNE: Our Land Beautiful explores different ways of seeing—and being. Filmmaker Nettie Wild in attendance.